This week I am excited for Queen of Air and Darkness by Cassandra Clare! 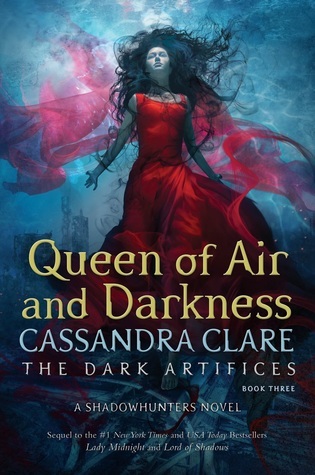 I have read all of the books in her Shadowhunter world, and I can't wait to see how this series ends! I have a feeling that it will rip my heart out and tear it to shreds, but I bet it will be worth it. I'm really hoping Julian and Emma both turn out relatively okay. I'm also curious to see what happens with the Mark/Kieran/Christina situation. I also can't wait to see Ty and Kit's relationship develop. They're young now, but I bet it will really flourish in The Wicked Powers. I really hope we get to see the origins of the parabatai curse as well. I'm also super excited, because Cassandra Clare is coming to my area on tour. I already bought a ticket, but I'm not sure if I'll be able to go since it's on the first day of my exams.